Get a timepiece to match your style and ensemble and share the love with a matching watch for him. 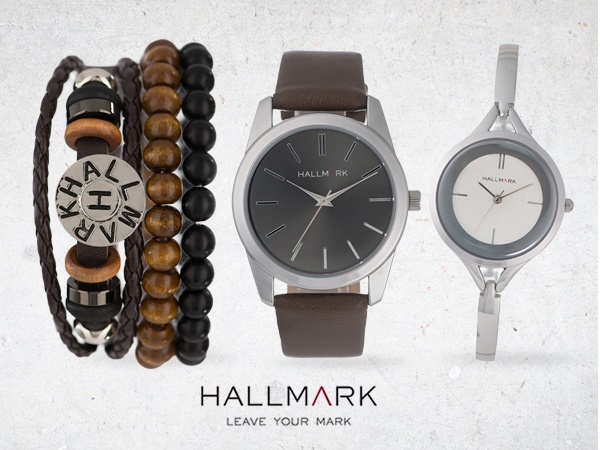 Hallmark has you covered with watches well-known for outstanding quality, affordability and design since 1990. Choose from a wide variety of styles for men and women – from colourful, trendy leather pieces to classic gold watches to match your style and mood. The watches come with a one-year quality guarantee! The ladies’ watch has a silver case and strap, complemented by a silver dial and dark-silver bezel on the case. The gents’ watch has a brown leather strap, silver case and brown dial with silver elements.The watch comes with an assortment of matching bracelets that will add to his unique style. Want to win one of the six watch sets worth R948? Simply answer the following question: What is the name of the quality watch brand established in 1990? Simply SMS your answer, followed by your name, surname, contact details and full address to 34683*. For more information about the brand, visit www.hallmarkwatches.co.za or call 011-257-6000. COMPETITION RULES, TERMS AND CONDITIONS The competition runs from 28 March 2019 to midnight on 11 April 2019. *Each SMS costs R1,50. Enter as many times as you like! You must be the owner of the cellphone or have permission from the owner of the cellphone to use it to enter the competition. Each entrant may only win one watch set. Staff of Media24, the prize sponsor and their families may not enter. You have to send the correct answer to the question to stand a chance to win. Winners will be chosen by random draw and will be notified telephonically. If a winner can’t be reached within three calls during business hours, a new winner will be chosen. Media24 and the prize sponsor take no responsibility for any damage caused by entering or taking part in this competition. Prizes are non-transferable and may not be exchanged for another prize or for cash. The prize sponsor is responsible for delivery of prizes within a reasonable time (4-6 weeks). It’s the winner’s responsibility to provide a daytime address for delivery or a postal address and to be present to receive the prize and/or timeously collect the prize from a post office. Media24 and the sponsor take no responsibility for loss of the prize should the winner not be present to receive it or neglect to collect it from a post office. By entering this competition, you consent to occasionally receive promotional material from Media24.